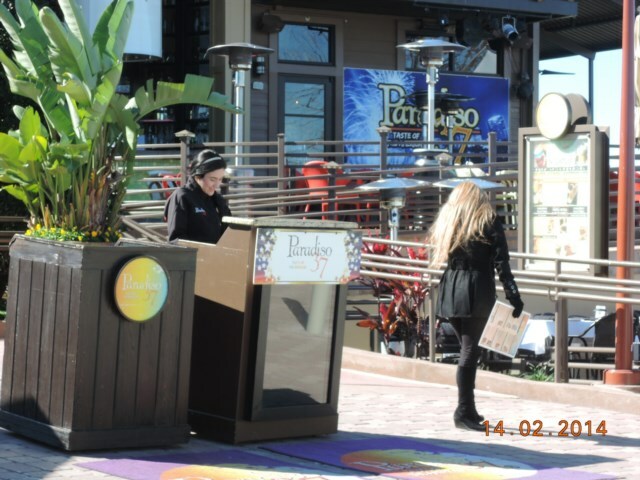 Next time you go to Downtown Disney you might like to visit the Paradiso 37 restaurant which opened in the summer of 2009 and is situated in the Pleasure Island district of Downtown Disney, between the Adventurer’s Club and Harley Davidson Orlando. The restaurant is very colourful and boasts the “Street Foods of South, Central, and North America”. There are 2 bars within the restaurant, and seating is split between the main level and an upper-level of the building. 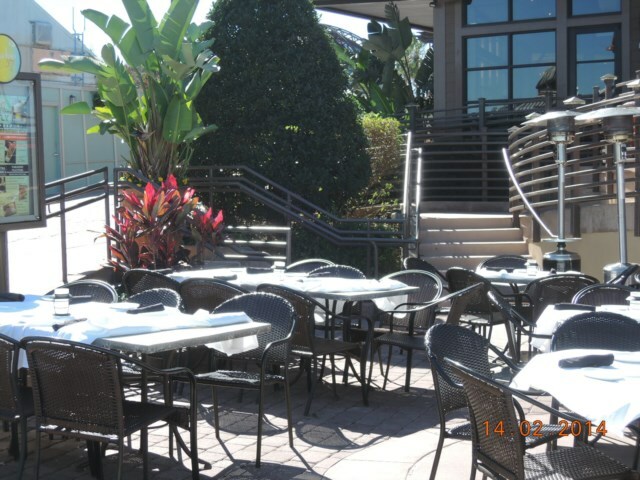 There is also Patio tables available for outside dining which offer great views of the boat dock and Saratoga Springs. 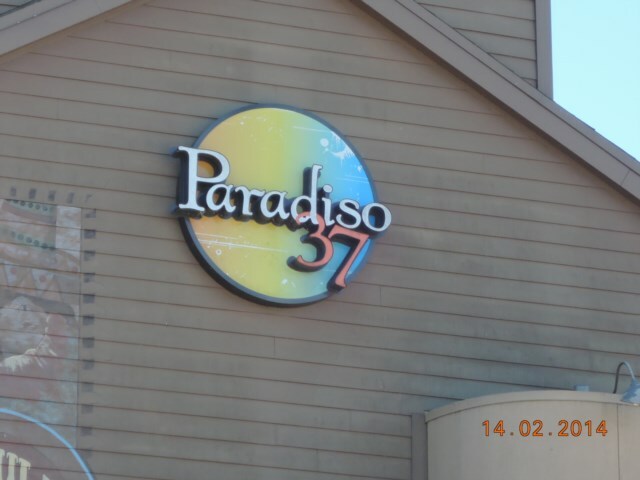 Paradiso 37 is open from 11:30 a. m. – 12:00 a. m. Sunday to Thursday and 11:30 a. m. – 1:00 a. m. on Friday and Saturday. Reservations can be made by calling the restaurant directly although they do not accept reservations during peak hours only up until 4. 00pm. The restaurant features an international wine bar and a one of a kind tequila tower bar which has to be seen to be believed, with more than 50 kinds of tequila and a selection of signature frozen margaritas. For those guests who are interested in beer, the restaurant takes pride in serving the coldest beer in Walt Disney World. For my appetiser I chose the Queso Fundido. The chips were served hot in a large bag alongside a bowl of Jack-cheese dip, which was garnished with scallions. It was lovely but I would probably have been better having it to share with someone or as an entrée as it was very filling. My Mother had Central American Crazy Corn which was fire roasted corn on the cob topped with a spicy yellow pepper sauce and chef' s special cheeses she really enjoyed this and is going to try to recreate this dish at home. The service was not at all rushed and as an entrée I decided on the Baja Burritos where you had a choice of chicken or beef. I had the beef and this was all served with black beans and rice, this is a dish I would recommend. Mother had opted for Surf and Turf Paradiso 37 Style - grilled BBQ shrimp and Argentinean skirt steak. This came with corn on the cob and street style potato pancakes. The desserts looked lovely but unfortunately we had already eaten too much and had to decline, next time we may skip the appetizer and have a dessert. Viewed 3651 times since 31 December 2009. Sweet Tomatoes; a pleasant surprise!